The censorship of a book by Swiss photographer Christian Lutz – thought to be the first of its kind in Switzerland – has sent ripples through the art world. 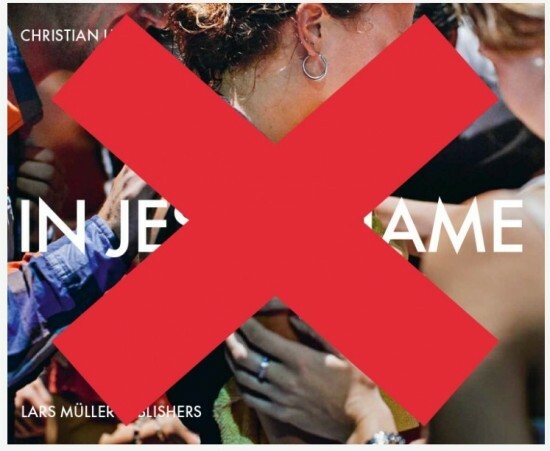 In Jesus’ Name, a photographic book on the International Christian Fellowship (ICF) in Zurich – self branded as “hip” religion – was temporarily banned when it came out in November 2012 during Photo Week in Paris. Lutz was wrapping up a trilogy on the theme of power that has taken him ten years to complete. On January 24, during a court hearing in Zurich, the ban was upheld. On the grounds that Lutz’s work is of public interest and to defend artistic freedom, a support committee has been formed. “I have always worked with the highest professional ethics,” Lutz vowed during a press conference at the Musée de l’Elysée in Lausanne. The renowned photography museum had already planned to present Lutz’s trilogy in June 2013, after showing several photographs from the yet-unpublished book at the beginning of 2012. The show will go on, he said, although it is too early to say in what form the banned photos will appear. Lutz’s investigations on the theme of power have earned him international recognition and several prizes. In Protokoll (2007), he revealed the behind-the-scenes power plays of Swiss diplomacy, followed by Tropical Gift (2010) on the manoeuvrings of oil companies in Africa, which showed up the cogs of economic power (see attached slideshow). “I am always looking for a narrative force,” he told swissinfo.ch, explaining the startling photographs that introduce us to unknown worlds. When he decided to dedicate the third part of his trilogy to evangelical religion, he approached the ICF – self-branded as “hip” religion – and met the church’s managers. He appreciated the fact that they examined his work carefully before giving him the go-ahead. “We have nothing to hide,” he was told, before receiving an email confirming how pleased the ICF was to welcome him. He also received a photographer’s badge to accredit his presence. The ICF was founded in 1990 as a non-denominational church “at the heartbeat of time” with the intention of attracting young Christians – either young in age or because they are (re)discovering their religion. Typical services include loud music, multimedia and live performances, as well as sermons by pastors as young as the people in the crowd. For an entire year, Lutz attended the gatherings, ceremonies, work-shops and camps that were to become the backbone of one of the first sociological photographic observations of an evangelical movement. He said he was always careful to obtain the approval of the managers and he befriended many of the participants, several of whom asked to be included in his book. As a result, when the book was banned by court order, Lutz was incredulous. In a class action, 19 people in 21 photographs – out of a total of 57 – declared that their image rights had been violated since the pictures had been taken without their consent. swissinfo.ch contacted ICF spokesperson and pastor Daniel Linder, who agreed to discuss the legal case, although he first made it clear that the lawsuit was not between the ICF and Lutz, but between the 19 people and Lutz. He said that because the photographer cannot prove the consent of the people he photographed, they were within their rights to have the book banned. “Although we cooperated by opening our doors, we warned Lutz to be sensitive. But he didn’t discuss his choices with us. The end result is not what we wanted,” Linder said. But the people knew they were being photographed, swissinfo.ch challenged. “We didn’t know they would be portrayed offensively,” he replied. Asked whether he and church leader Leo Bigger were also in the book, he answered that they would have no legal recourse because, as public figures, their images already belong in the public domain. Asked whether the ICF wasn’t concerned about the negative publicity, Linder replied that the court case had nothing to do with the ICF. Evangelical churches have been an area of interest for the past 15 years for Philippe Gonzalez, lecturer at the Sociology Laboratory of the University of Lausanne. He revealed at the press conference that the ICF Zurich – unlike the majority of evangelical churches in Switzerland – is not organised as an association that reports to a general assembly composed of the faithful; instead, it is a series of businesses. He supplied swissinfo.ch with evidence from the Registry of Commerce to support his claim, excerpts on which the signature of Daniel Linder unfailingly appears. It is unclear what roles the other five “staff” pastors – Leo Bigger, Michael Sieber, Nicolas Legler, Raphael Abt and Stefan Kipfer – play in what is ultimately a private power structure. This information may lend credit to the hypothesis ventured by Christian Lutz that he has come up against a corporation and is being censored because he has not played the corporate marketing game. Sam Stourdzé insisted on the sociological importance of Lutz’s observations: an overriding factor, in his eyes, when it comes to deciding whether a work should be published or not. To date, more than 80 artists and political figures, including former cabinet minister Pascal Couchepin, have joined the support committee against the ban. “I never thought the power of religion would lead me to the power of the judiciary,” Lutz said. Because of the court case, not a single photo from In Jesus’ Name was available. But swissinfo.ch had access to a copy that was purchased before the ban and can confirm that Lutz has worked in his usual powerful vein and tapped into the emotional roots of evangelism. In the event, the question of why the 19 people who objected to being photographed did not turn against the managers of the ICF who were the ones to allow Lutz to photograph them has been raised.